Memorial Day is a day when we give thanks and pay tribute to our heroes fallen and otherwise. Usually those heroes are military personnel who have given the full measure of service, but tonight at Lawrenceburg Speedway we saw many heroes. A Hero is defined as 1) remarkably brave person: somebody who commits an act of remarkable bravery or who has shown an admirable quality such as great courage or strength of character 2) somebody admired: somebody who is admired for outstanding qualities or achievements. There were a lot of heroes on the track tonight in Indiana. From those that passed the helmet for the family of a fallen friend to those that braved the choppy rough track and brought home remarkable finishes. Donny Schatz was just one of those. The racing family took the track tonight with heavy hearts. Just two days ago one of our promising young stars lost his life in an on track accident at Bloomington Speedway. Josh Burton was 22 years old. Several drivers paid tribute to Josh by running Hoosiers with orange sidewall lettering as he always did. Many from every kind of racing were in the house to pass the helmet to assist his family. Josh’s memory will live with us forever, but he will never be gone from us. Josh was an organ donor and he gave life to many with his selfless and thoughtful gift of life. The 37 car field would qualify 36 cars with Dale Blaney scratching on the night after having engine troubles in hot laps and again on the approach lap to qualify. Blaney would post no time. The fast qualifier for the night would be Daryn Pittman with a lap of 12.173 seconds. Sammy Swindell, Cole Duncan, Kraig Kinser and Craig Dollansky would round out the five fastest qualifiers. The heat races were a profile in courage and talent as the rough and choppy track had many bouncing the cars and fighting to keep them from digging in the frame rails as they went around the track. There was some moisture on the bottom which threw up some wet clay to the middle allowing for traction there, but the fast way around the track was through the obstacle course on the cushion. The first heat would be won by Outlaws point leader Daryn Pittman with teammate Cody Darrah coming in second. Also transferring to the A Main were Jason Sides, Steve Kinser and Craig Dollansky. Steve Kinser put on an incredible display of talent and experience when he started last in the heat and was in fourth spot in three laps. The surprise of the evening may well have been visitor Tony Stewart who ended up seventh and in the Last Chance Showdown. Stewart’s car was obviously struggling with the rough surface and a loose condition. Also relegated to the Last Chance Showdown was Outlaw legend Jac Haudenschild who is known for his preference for the top side of the track. Tonight that preference hurt “The Wild Child” as there was no consistent traction on the cushion. The second heat was dominated by the current champion Donny Schatz. Schatz who has been on a strong hot streak for the last few weeks, walked the dog on the field winning by three seconds over Kerry Madsen, Sammy Swindell, Paul McMahan and ASCOC standout Greg Wilson. Sheldon Haudenschild would just lose the final transfer spot on the backstretch of the final lap relegating him to the Last Chance Showdown along with USAC Midget Champion Robert Ballou who made a rare winged sprint appearance this evening. The third heat race was a battle of the invaders with legendary Winged pilot Shane Stewart coming home ahead of Brady Bacon, Danny Holtgraver, Cole Duncan and Outlaw Super Sub David Gravel. The final heat was won by a dominating Chad Kemenah who came home 3.4 seconds ahead of Sam Hafertepe Jr, Joey Saldana, Kraig Kinser and Tim Kaeding. Both of Outlaw legend Bobby Allan’s cars driven by his son Jacob and his grandson Logan Schuchart were sent to the Last Chance Showdown just missing the transfer spots in sixth and seventh. The Dash inversion draw was an eight pill putting Donny Schatz on the pole for the six lap race to determine the top five rows of the A Main. Schatz would dominate the race over an ever persistent challenge from Cody Darrah. Brady Bacon would break a front wheel and retire from the event on Lap 3. The Last Chance Showdown had predictable results for the most part with USAC Triple Crown Winner, Tony Stewart dominating the race. The big surprise came from Brandon Wimmer who came home second after holding off the ever wily Jac Haudenschild and Danny Smith. The A Main was a barn burner of a race. Donny Schatz took the lead at the drop of the green but lost it half way down the back stretch to Chad Kemenah. Schatz would regain it for a few laps until Kemenah took the spot in traffic and set sail. Schatz worked the middle of the track and the rough cushion like a master jockey working a finicky thoroughbred in a strange practice ring. Schatz would regain the lead on Lap 28 and pull away from Kemenah for a nearly four second lead. Kemenah would battle with Shane Stewart for the entire remainder of the race with Stewart taking the runner up spot on the next to the last lap. Sammy Swindell would have an odd occurrence when the rough track broke the nose wing bracket causing him to lose the wing with four laps to go. Swindell would finish in fifth sans nose wing. David Gravel would run a very steady and very consistent race moving up to eighth from 19th to take the Hard Charger award. The show of the night was once again Steve Kinser. Ever the master magician, Kinser would start last on the field and work his way up to 10th before in an attempt to miss a spinning Cody Darrah Kinser would spin the Bad Boy Buggies No. 11. 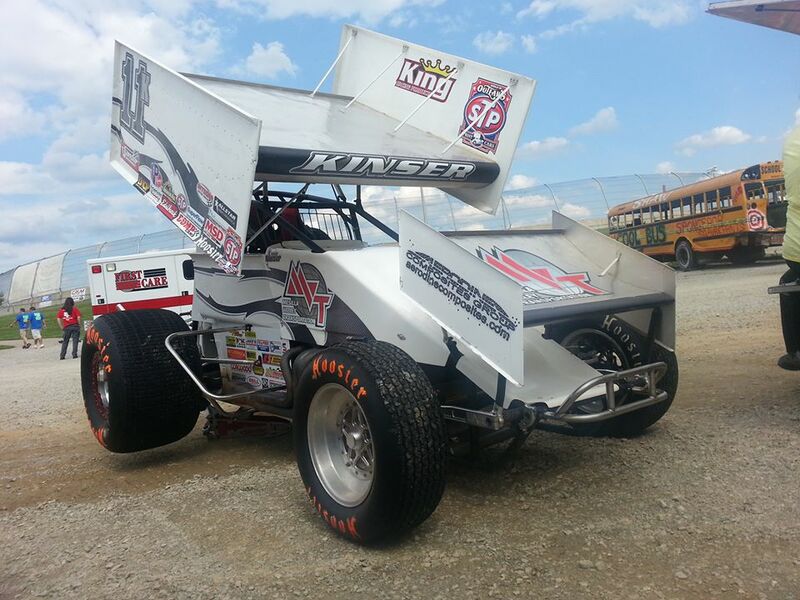 Kinser would refire the car start at the very back again and work his way up to 17th in just 23 laps. If there was ever any question as to whether Steve Kinser was still the King of the Outlaws this race should erase all the doubts. The incredible car control and instincts of the greatest dirt car driver to ever climb behind the wheel were evident from the drop of the green flag. To come from the back to the front once is one thing but to then come back from the back to 17th in that short of a period of time on a rough and challenging track is a phenomenal performance. John Wayne once said that a hero is someone who will do what needs to be done when no one else will. Tonight Donny Schatz did just that. When driving his STP/Tony Stewart Racing No. 15 winged sprint car, like a sprint car didn't work, he began driving it like the 2300 pound late model he had won with the last two nights and it worked. It gave him the edge that he needed to make the daring bottom side pass to take the lead. Then it was matter of doing what Donny Schatz does best, win. Sammy Swindell took a car with no down force over the front tires and man handled it the final four laps with no nose wing, a feat that is not suggested for the faint of heart with a 900 horsepower engine between your knees. Steve Kinser muscled his way through a crowd, sacrificed his run to ensure the safety of his car and the car of a young man who lost control and then muscled his way as far back up as he could. Something that maybe a handful of drivers in today’s sport could have done. All three men would tell you that without the service of the men and women that keep us safe from our enemies abroad and within they could not do what they do. Without that sacrifice over the years they would not be pursuing their dreams and winning races. In the end, it is an incredible coincidence to find that these three men are looked at as heroes by the men and women who have made it possible for them to race. Heroes are exceptional people. Heroes can also be common people. We as a nation are blessed to have both within our midst. Scratch for the night Dale Blaney with engine trouble. Writer’s note: I would like to take this opportunity to offer the thoughts and prayers and sympathies of everyone at Skirts and Scuffs to the Burton family on their loss. It is hurt that we as a community share with you and yet never really can. Know always that we will remember and that you are in our thoughts and prayers. – Ro Cowan.